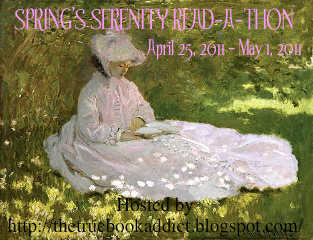 Welcome to all the Readers from the Spring's Serenity Read-a-Thon. This is a week-long read-a-thon, so if you're not signed up yet, you may still have time! Just hop over to The True Book Addict to sign up! I'm hosting my very first mini challenge. A few weeks ago, I came across a blog called The Page 69 Test. From what I've read, this test was suggested in a book by John Sutherland called How to Read a Novel: A User's Guide . Basically, he says if you're browsing books and want to find out if you'd be interested in a particular book, you should read page 69. This should give you an idea as to whether the book is right for you. So, my mini challenge, should you choose to accept it, is for you to go to page 69 of the book that you're currently reading, and leave a comment ~ or write a blog post and leave a link to it in the comments ~ telling us about page 69 of your book. What's happening on the page and does it impact the way you feel about the book? If you read more than one book, feel free to come back and comment for each book you read. I'll draw a winner at the end of the read-a-thon. If you're concerned about reading ahead in your book, just wait until you're up to page 69, and then enter the mini challenge. The challenge will be open throughout the entire read-a-thon. A winner will be drawn using random.org. The winner will get a paperback copy of Last Snow by Eric Van Lustbader, courtesy of the publisher. Good luck and have fun reading! My current read is Mistress of Rome by Kate Quinn. Page 69 is essentially about the central gladiator character drowning himself in wine after a great battle and the main slave girl character coming in to deliver a message to him. I think this works well with what I have read so far because these types of scenes between the two characters seem to happen often and you get to see a little heart in the characters. That's great! Thanks for entering! What a fun challenge! I'm reading Bitter Frost by Kailin Gow, and have posted my mini-challenge on my blog. Definitely like the Page 69 idea! That's interesting that page 69 is so indicative of the book and shows it's not really for you. It sounds like maybe you need to move on to a different book! Thanks for participating! Page 69 of Chime by Franny Billingsley is definitely interesting. The style of writing is different from most, and we can see that someone has recently died. and there are ghosts .. which is pretty cool. Page 69 of Blameless by Gail Carriger: If I hadn't read the book, the page would not really give me enough information to know whether it was interesting or not. It DOES, however, speak of the Templars and supernaturals, which might be enough for me to want to know more. I think that with my next book, Secret Daughter, I will read page 69 first to get a truer impression of what the page makes me feel, as doing it after could be influenced by my feeling about the entire book.